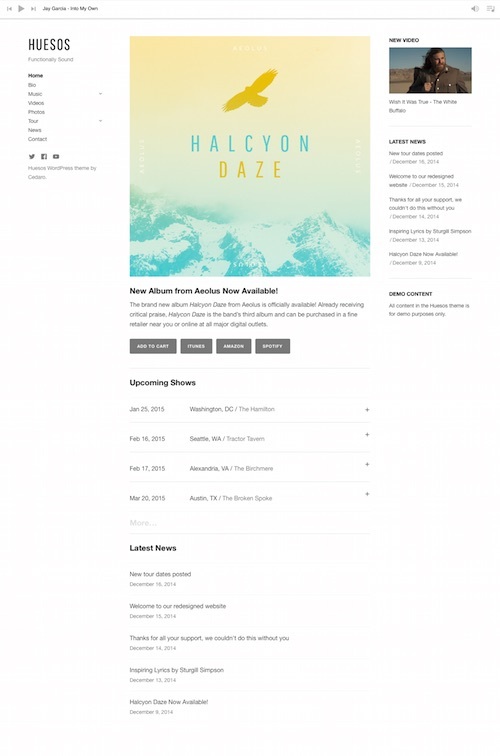 This is a collection of awesome band and music WordPress themes for musicians, music fans, DJ’s, bands and music bloggers wanting to build a professional and great looking music or band website with WordPress. 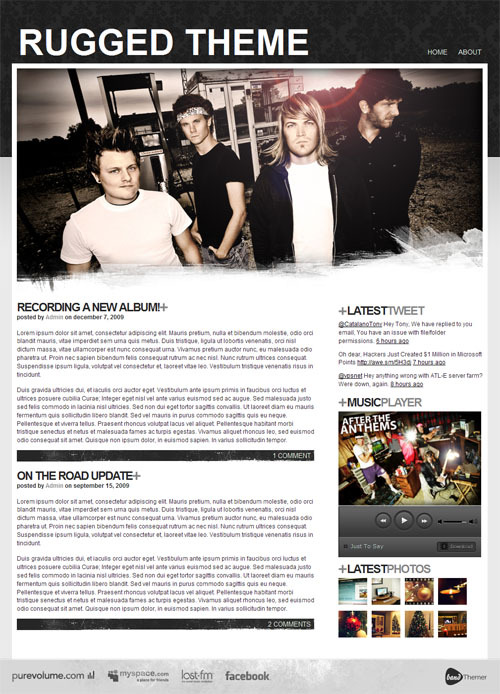 WordPress is an excellent platform to build a band or music website on because it’s free and easy to set up and operate. 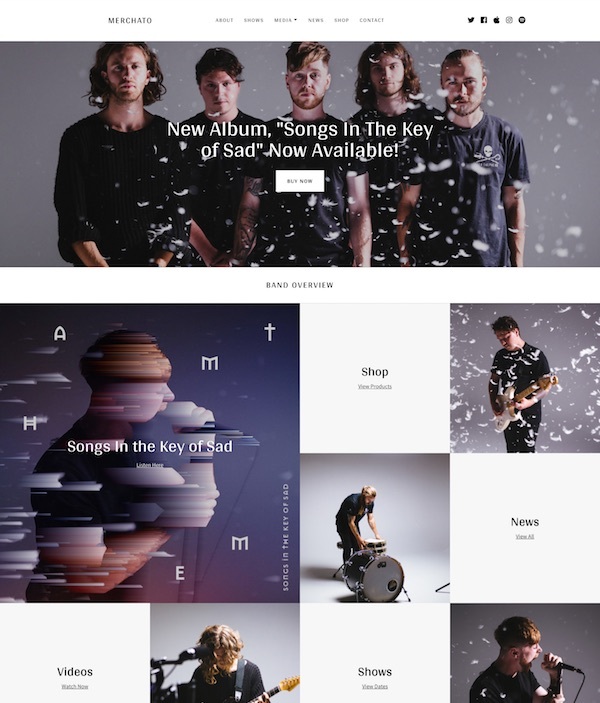 Using one of these specifically designed themes will transform a WordPress blog into a great looking music or band oriented website with all the features required by musicians and bands. 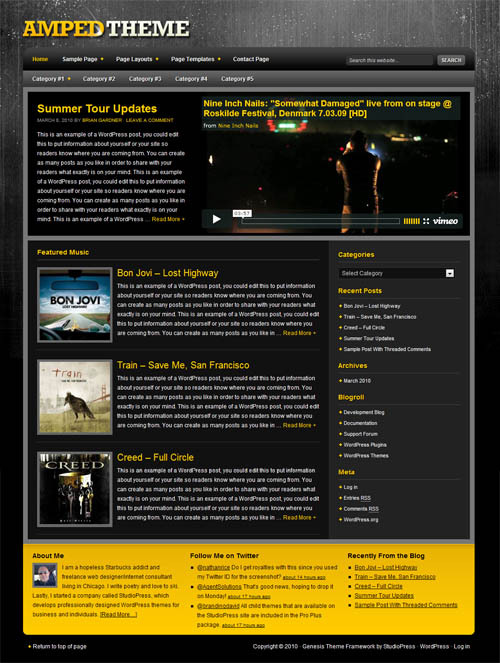 Some of the great features in the various themes include: custom MP3 audio players, concert and tour date calendars, photo, video and events galleries, options to sell you merchandise, discography / song / album pages, social networking, and video / audio player compatibility with the popular music and video sites such as ReverbNation, Mixpod, SoundCloud, Playlist.com, YouTube and others. 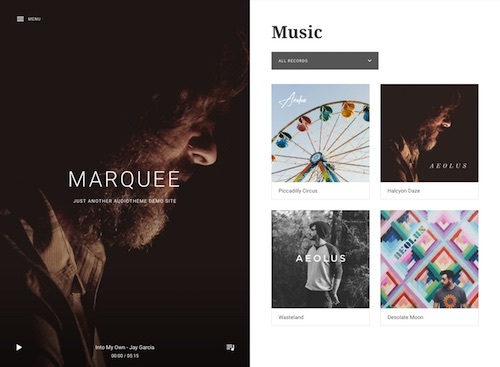 So if you want to create a rocking WordPress music website, but avoid head banging frustration doing so, check out the 30+ premium WordPress music and band themes below. 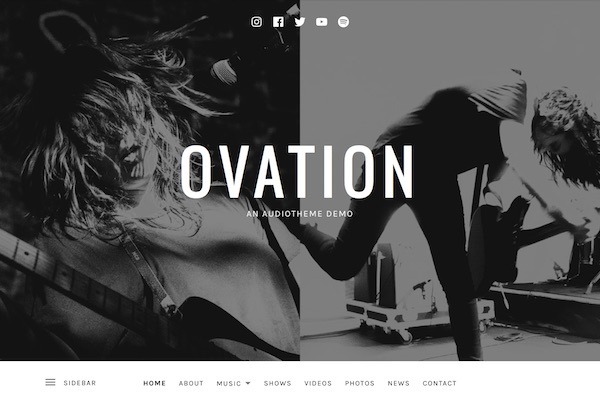 A band WordPress theme with a simple, grungy design that allows you to easily include your latest videos, audio and photos. 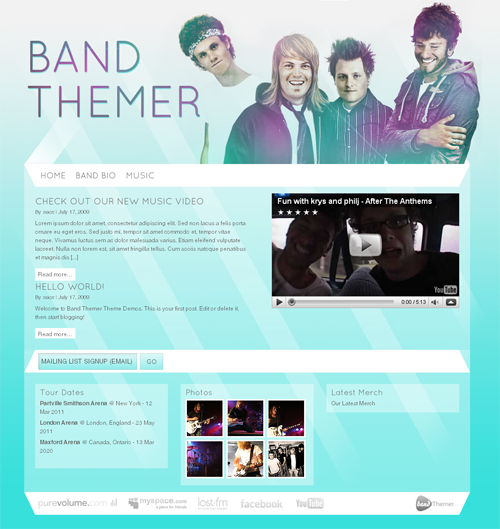 A fresh, clean theme featuring band photos, videos, news, shows and events. 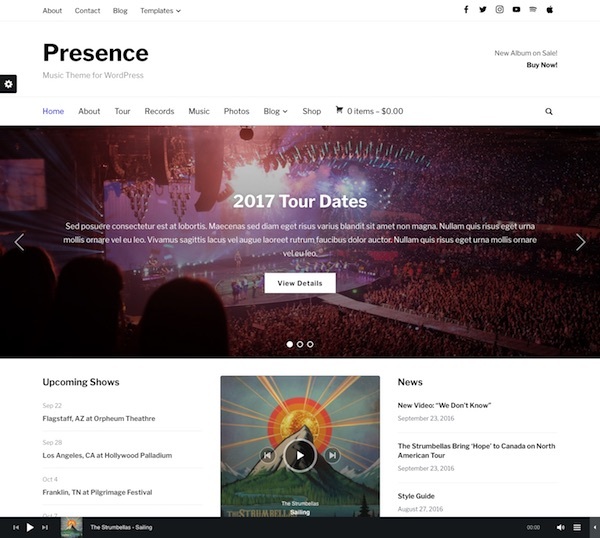 You can include your latest YouTube videos, Myspace music player, links to Merch and more. 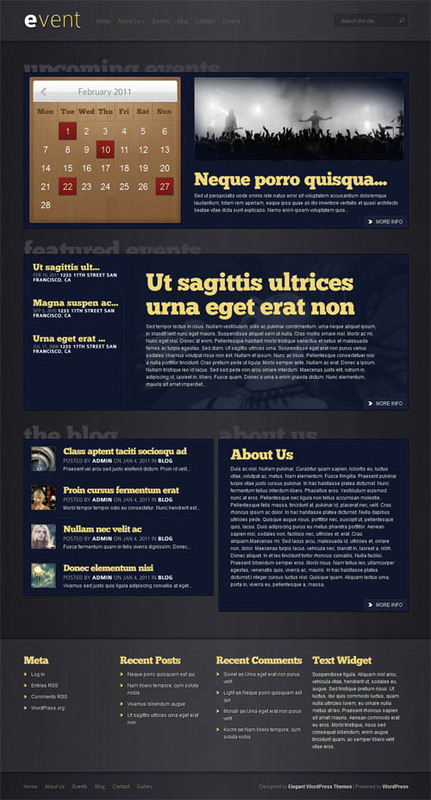 It is fully customizable including the ability to quickly change your header image. 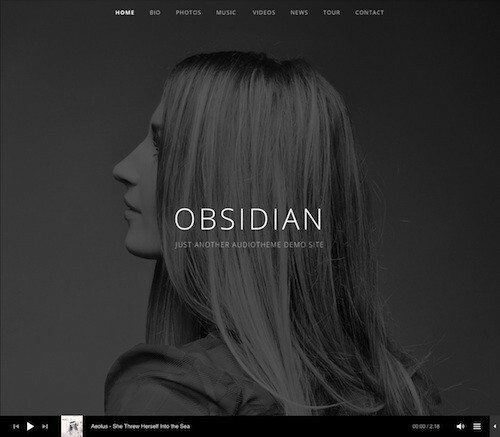 A beautifully simple, organized theme designed around content: photos, news, events, blogs, and music. 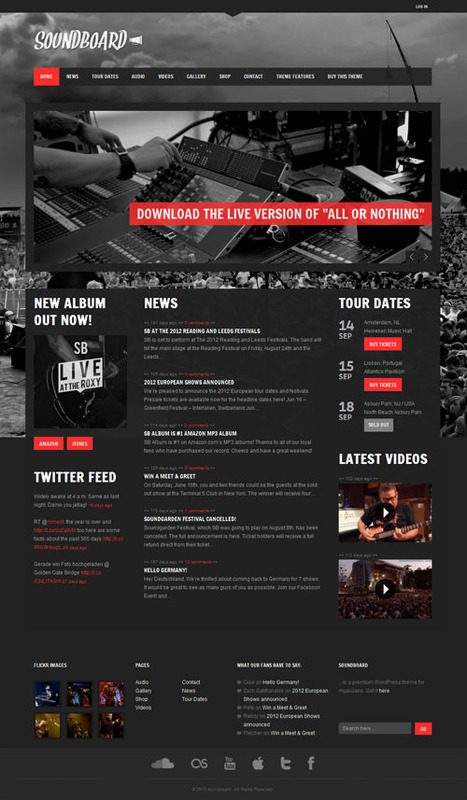 The themes include features specifically geared for bands such as embedded music, video, and photo options, tour date listings and social media links to connect with the fans. 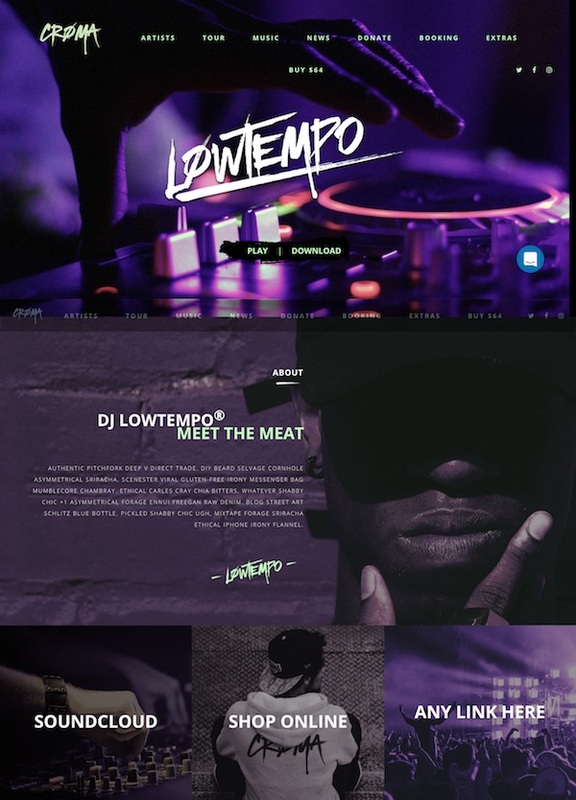 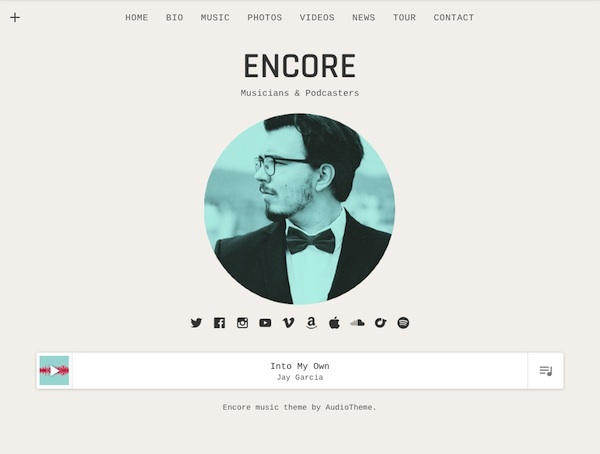 An edgy, colorful, and current theme based around connecting with fans, delivering music, videos, and photos. 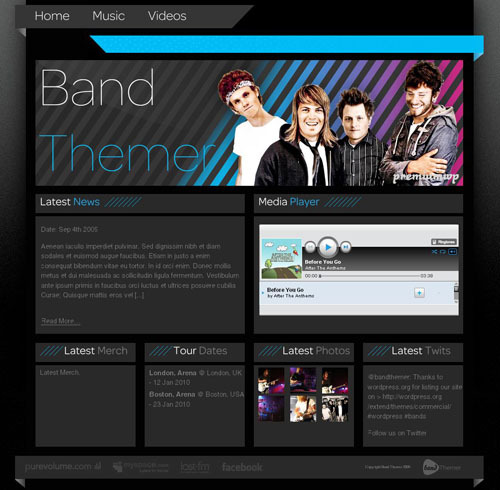 You can include your latest YouTube videos, TunCore player, Myspace music player, links to Merch and more. 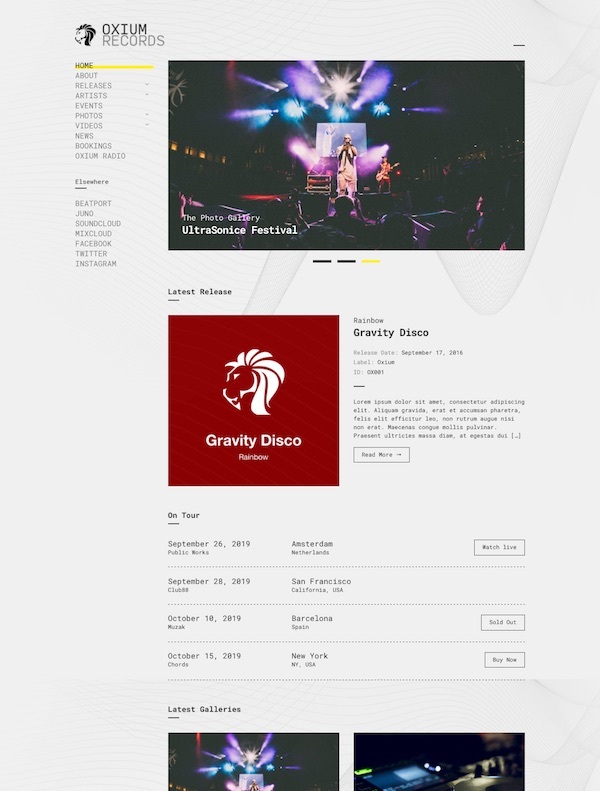 A versatile premium WordPress theme from Elegant Themes that allows you to transform WordPress into a cool music or band site or a fully functional events website. 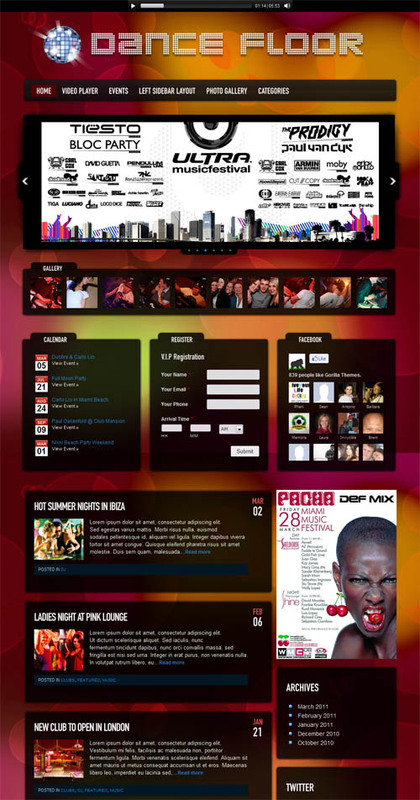 A core element is the interactive calendar that can display all your events, past and present in an intuitive interface. 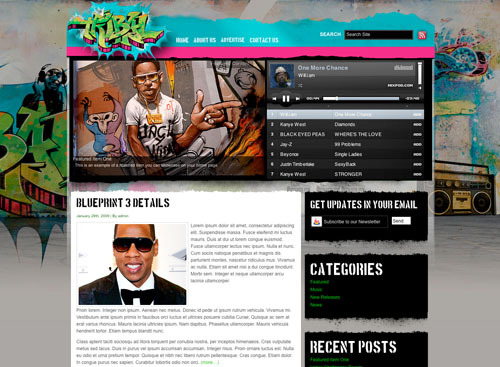 Other features include additional listing info, 5 colour schemes, optional blog style structure, advanced theme options panel and more. 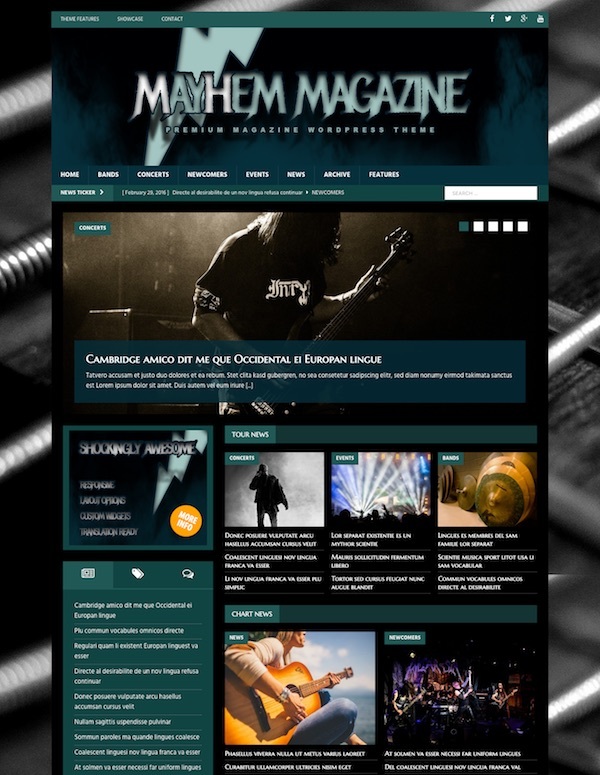 A dark music premium WordPress child theme built to spotlight your latest video, showcase your music and the show dates you need to promote. 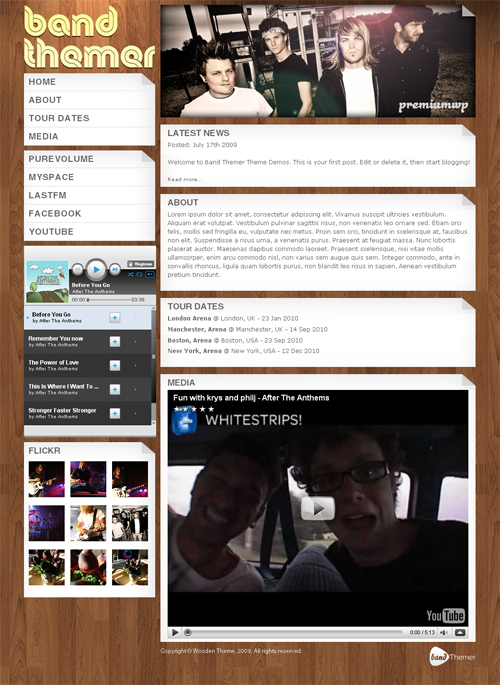 The theme includes a featured video on the homepage, drop down menus, numerous layout options and a backend theme options panel. 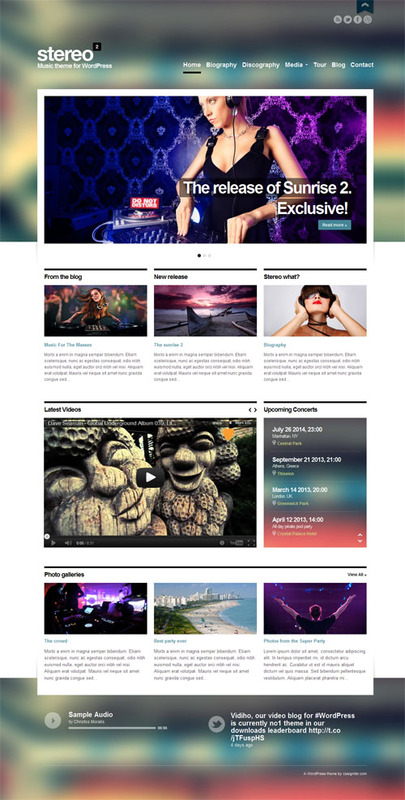 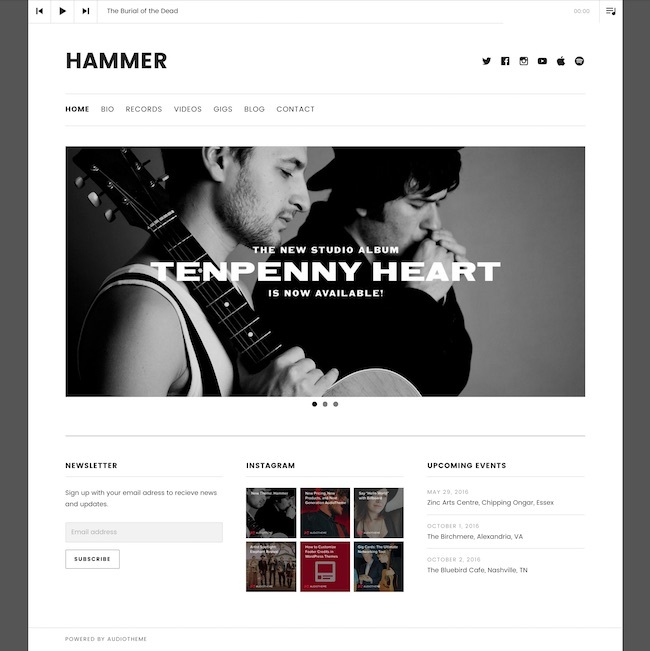 The Best Music WordPress Themes – complete gallery of ALL the best WordPress music themes.